The seventeenth episode of the Yes Music Podcast featuring the studio tracks from the sixteenth studio/live album, ‘Keys to Ascension 2’. Is the same quality and feel retained from Keys to Ascension? Is this 1977 or 1997? Does splitting the studio tracks between two albums work? The Danglers were extremely generous, intelligent and fun guests. We talked about Yes, The Danglers, music technology, the state of the music industry and many other fascinating topics in an engrossing and entertaining interview. It’s a little longer than the usual podcast episodes but I can promise you that it’s well worth listening right to the end! 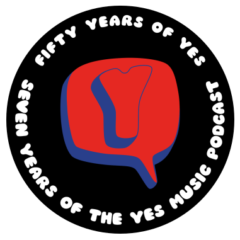 The sixteenth episode of the Yes Music Podcast featuring the studio tracks from the fifteenth studio/live album, ‘Keys to Ascension’. A classic appearance – a classic sound? Are we ‘back to the 70s’?